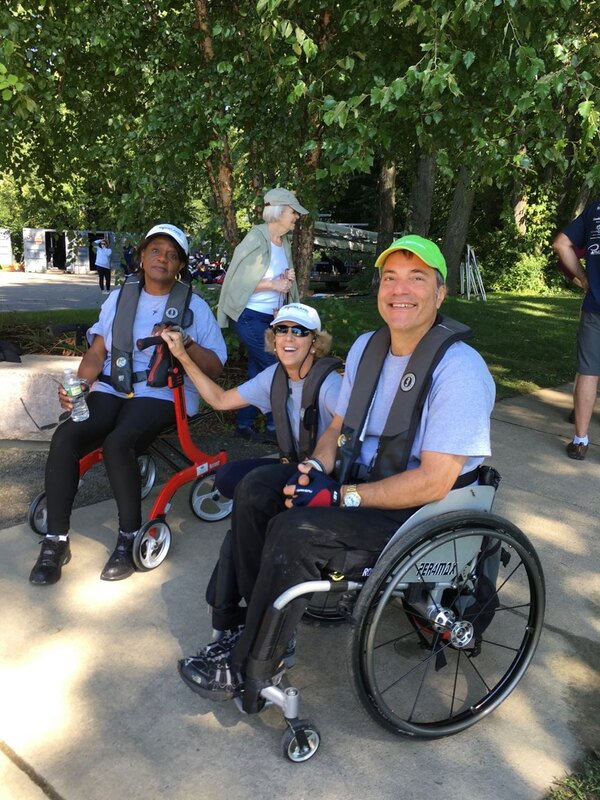 Hartford, Connecticut — Rockland Rowing Association’s adaptive team traveled to Hartford, CT on September 29 for a difficult but ultimately successful head race on the Connecticut River. Coach Greta Nettleton was really impressed by her team’s determination and resilience. “The heavy current tested everyone’s strength to the max. We really saw everyone’s fighting spirit in this event,” she added. The course had to be shortened to 1,000 meters; it was all upstream into a ferocious current running at least 3-4 mph, fed by the heavy rain earlier in the week and the rowers pulled the equivalent of several times that distance. Luckily, the weather was beautiful, and our races all went off at lunchtime, making the logistics quite smooth. Ron Gold won gold in his PR1 single event. Both our other rowers were racing for the first time; Sheila Savage rowed with volunteer Diana Costanzo in the PR2 double event and won silver; David Streich, who recently joined the club and was rowing in a double scull for the first time ever, was unfazed by the situation and brought home a gold medal, rowing with volunteer Alexander Lalire, and beating the entry from the Connecticut Adaptive Program.